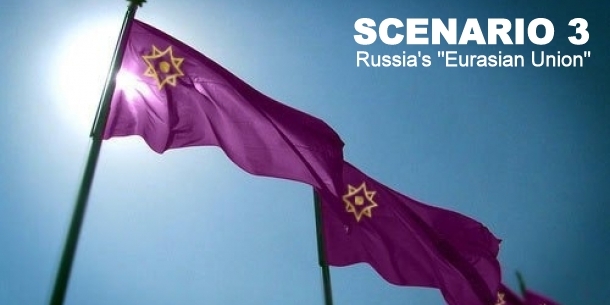 Scenario 3: Russia's "Eurasian Union"
Home / Conflict / Conflict Resolution / Opinion / Russia / Ukraine / United States / Scenario 3: Russia's "Eurasian Union"
In this article, we will focus on the third scenario out of four possible ones, which is in continuation to Scenario One and Scenario Two published earlier. Our main goal, however, is to use the scenario tools in order to “describe” a hypothetically possible development of the Russia-Ukraine crisis in the context of the relations between the Kremlin and the Western liberal democracies. But the geostrategic focus of study will remain the same: the Ukraine-Russia crisis represents an attempt to redefine strategic relations a quarter of a century after the end of the Cold War. The development of Russia after 1991 has undergone two stages that are entirely different in their foreign policy orientation. The first stage was under the governance of President Boris Yeltsin and was characterized by a clearly pro-Western orientation to liberal democracy. President Yeltsin’s policy was centered on the desire of the Russian political elite at that time for a strategic partnership with the US. The politicians around Yeltsin believed that, since the Russians themselves were disappointed in the Communism that had been in construction for 70 years, and since the presidents Gorbachev and Yeltsin had personally taken part in dismantling the Soviet totalitarian system, it was normal that Russia should preserve its position from the Cold War period and continue to be a world superpower. Yeltsin and the people around him saw future Russia as a European state in the European Union and, in their bolder dreams, as a member of NATO as well, in a long-term perspective. Coming to power in 2000, Vladimir Putin radically changed this political priority. Then began the second stage in the development of Russia after the Cold War; the basic elements of policy here were Putin’s attempts to reintegrate the so-called post-Soviet space around Russia, either in some collective defense structure or in the form of economic cooperation (the SCO, including China), as well as the strategy of using energy sources as a means of exerting pressure on Europe. The high points of this process are two very important ideas personally expressed by President Putin. The first idea involves the creation of the so-called customs union meant to facilitate economic ties in the post-Soviet space and to integrate the countries there along certain economic lines. This is how the “Ukraine” problem actually started―by the refusal of that country to take part in the customs union. Why Ukraine in particular? Because President Putin, like Z. Brzezinski, is convinced that, without Ukraine, Russia would lose its chances to once again become a world superpower. Since the customs union never started functioning (for more than 6 years now, its membership consists only of the first three founding states plus Armenia, which joined in July 2014), Vladimir Putin decided to accelerate the process by proposing a new formula, a new model for integration of post-Soviet space around Russia. He presented this second idea of his in September 2013 at the international Valdai meeting in Sochi, and before that, in a theoretical program article published in October 2011, in which he writes about the “decline of the West”, about the inability of liberal democracies to develop upwards under the conditions of the early 21st century, about the aging of Europe and its continuously decreasing power, about “the crisis of the US” and their loss of moral authority after the wars in Afghanistan and Iraq. In his speech, Putin rejected the West’s political system and its mentality and spiritual character. Putin stated that the Euro-Atlantic states had renounced the roots of Western civilization and, by their politics, had become a threat to human values, including Christian values. As an alternative to “the old woman Europe”, as he styled it, Putin proposed the creation of a Eurasian Union that he qualified as the carrier of the new values for the 21st century and as a “type of civilization”. This new civilization, in his view, should serve as a counterweight or counterbalance to the world of liberal democracies. In the geostrategic aspect, the Eurasian Union should be built as an “independent center for global development”. In this new “civilization-center” as Putin called it, the second most important element after Russia is Ukraine. As soon as they were publicized, these ideas of the Russian president became an important part of the foreign policy doctrine of Russia. It was because of the political contradiction between Ukraine and the “Eurasian Union” that the protests on Maidan Square began. Viewed in this perspective, those events and their developments until now seem to be not so much a matter of a geopolitical as a civilizational choice of the Ukrainians, a choice between the world of liberal democracies and the Kremlin’s “Eurasian Union”. The building of a new civilization through the reintegration of the post-Soviet space is an interesting and significant project in its conception. Certainly, this is Russia’s most significant and most ambitious project in the time after the Cold War. It is not clear when, or whether at all, this project will be realized; it is too early to judge. Russia’s orientation towards the Eurasian mega-project, however, will put Russia in a very difficult situation. First of all, the Eurasian Union project will hardly be accepted easily by the neighboring countries to the south-east. A powerful global player is located in that direction―China. As mentioned above, China is the second most powerful economy in the world and has set itself the priority goal of becoming “world power No. 1” in the following three decades. That was the decision and the program for China’s development until 2050, adopted at the latest congress of the Chinese Communist Party. If the Chinese pursue this program, a powerful Eurasian Union built by the Kremlin will be perceived as a serious rival on China’s path to global leadership. The sharp rivalry would automatically appear between Putin’s Eurasian Union and China’s ambitions for achieving world dominance in the following decades. 2) The powerful economic alliance between the USA-European Union-Japan-Canada- South Korea, which is intensively consolidating, especially after the annexation of Crimea, and which has behind it the only important military union today, NATO. Assessed in this context, the “Eurasian Union” scenario implies that Russia will be involved in a very hard struggle for global influence, while lacking, at present, any significant strategic, economic or military allies. This would be a battle against two economic giants: China, with its annual GNP of about 9.1 trillion US dollars, and the alliance between the US, EU, Japan, etc., with a total annual GNP of over 40 trillion US dollars. We recall that Russia’s annual GNP is about 1.4 - 1.5 trillion US dollars. While Russia’s share of the world economy is about 2.9%, that of the EU is around 24% - 25%, of China, is 13%, etc. Russia’s military budget for 2013 was more than 15 times less than the combined military budget of EU, USA, and Japan. Will Russia be able to balance these strategic, economic and military characteristics if it enters a new spiral of economic, military-strategic and political confrontation? Kanchev, R. (2016) “Krimnash”: Is the Cold War Over?. Open Access Library Journal, 3, 1-22. doi: 10.4236/oalib.1102766. Copyright © 2016 by author and Open Access Library Inc.This work is an excerpt taken from a research article which is licensed under the Creative Commons Attribution International License (CC BY 4.0).